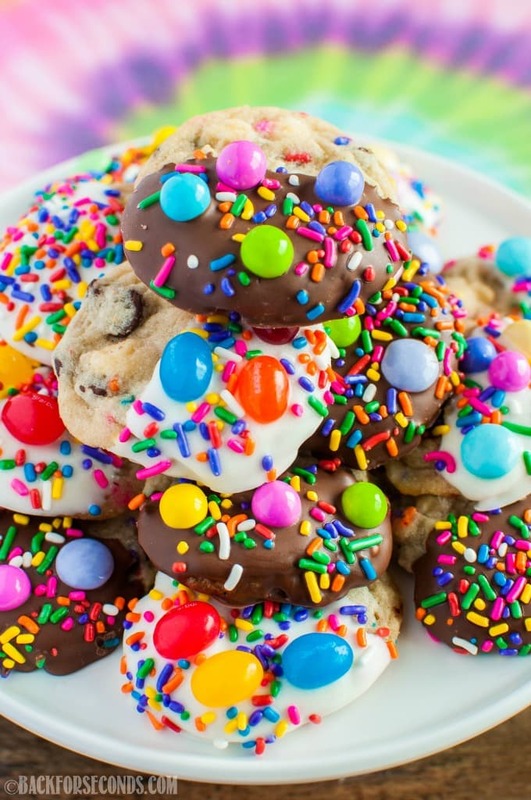 Funfetti Candy Cookies – soft, chewy cookies dipped in chocolate, sprinkles, and candy! 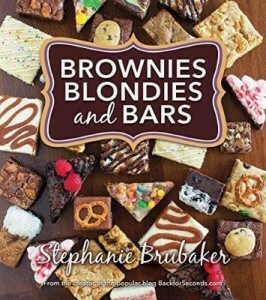 Great for Easter dessert, birthday treats, celebrations and parties! Making these cookies earned me the title of “Best Mommy Ever!!!”. 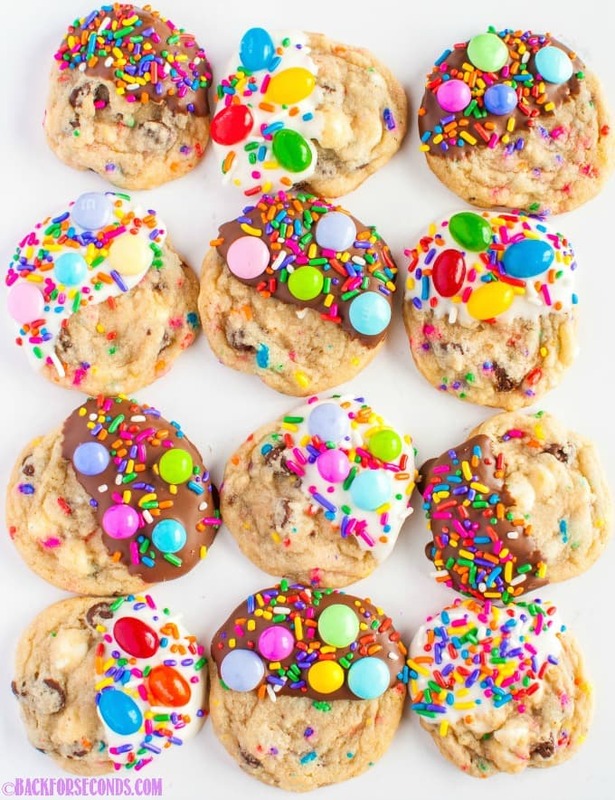 What I’m saying is, if you make these, children and sprinkle/candy lovers will adore you! 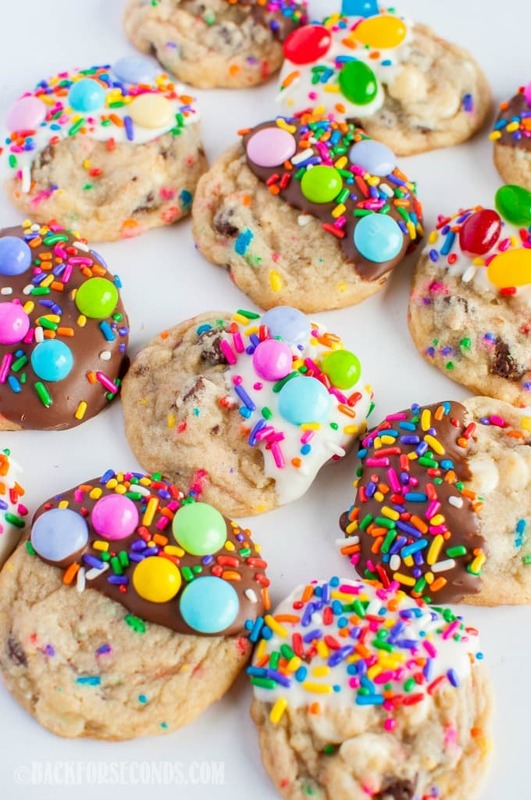 Not only are these cookies really fun to look at, but they also taste amazing! Set them out for Easter next week and watch them disappear! I made the mistake of walking down the Easter candy aisle at the grocery store last week, with all 5 kids in tow. Needless to say, we ended up with a few colorful candy items in the cart. At first, I was thinking I would make a fun Easter fudge! Then I realized I forgot a key ingredient when I went shopping, and it was cold, sleeting, and extremely windy outside. I just didn’t have it in me to run back out to the store with my little ones. I tried to come up with something colorful and fun that would be great for Easter, and then the idea for these cookies came to mind. I made the cookie dough with my 3 middle boys. We baked them and the kids ooohhhhed and ahhhhhhed over the sprinkle cookies. 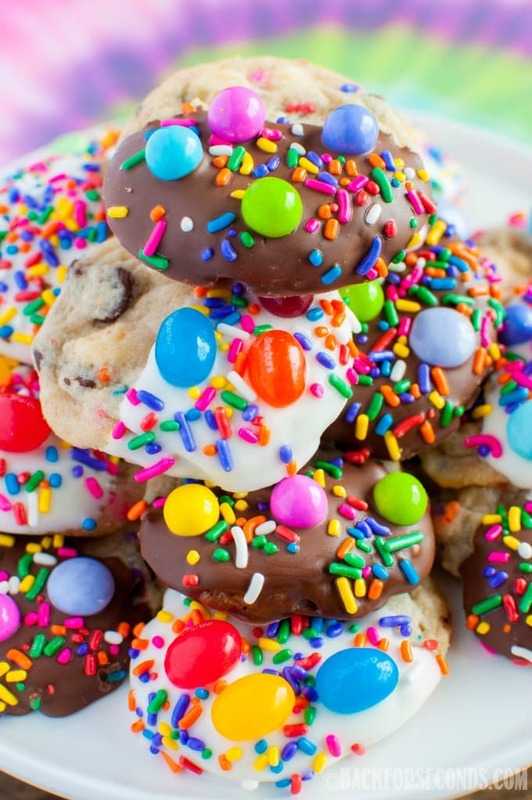 Then while they were playing, I dipped the cookies and added all the candy and sprinkles. You should have seen their faces when they saw these cookies on the counter. Their eyes were as big as saucers. CAN WE EAT ONE?? They each chose “the best” cookie and immediately dubbed me the “Best Mom Ever!” I’ll take it. These are so perfect for Spring! They will look so pretty on our holiday dessert table. Those are such happy-looking cookies 🙂 My kids would have a blast making them! How fun are these?! I love the colors. I love all of the colors! 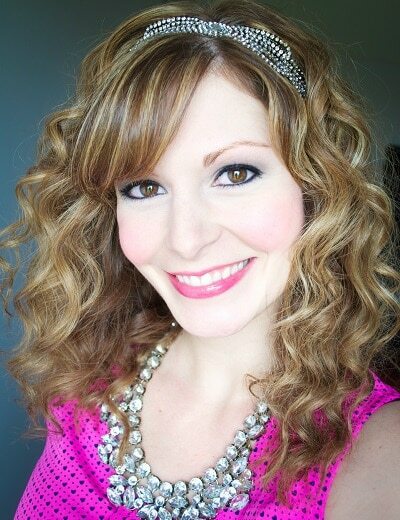 I bet kids would love to help decorate at a birthday party! I try and avoid that candy aisle like the plague but these looks so fun I might need to reconsider just to make these cookies!! My boys will go crazy when they see them! This is a great idea for my kid and me! We need to try these! 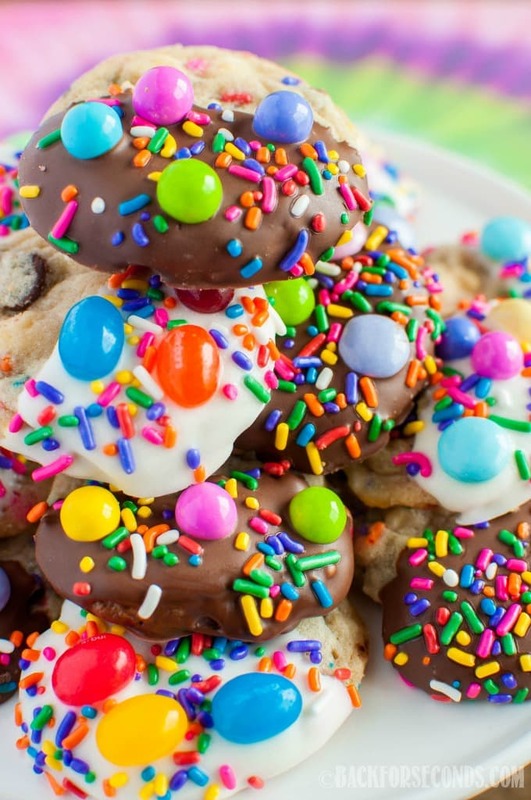 Funfetti Cookies?! I’m seriously in love! How fun. Great for the kids!